Some people tell me that I shouldn’t be too critical because the U.N. also helps poor people with foreign aid. Indeed, the U.N. has a very active project to encourage rich nations to contribute 0.7 percent of their economic output to developing nations. I generally respond to these (in some cases) well-meaning folks by explaining that there’s a big difference between good intentions and good results. If you examine the evidence, it turns out that redistribution from rich nations to poor nations is just as counterproductive as redistribution within a society. An article in The Economist succinctly summarizes the issue. It starts with the rationale for foreign aid. After the second world war, a new “development economics” came to dominate policymaking…, often at the urging of international institutions such as the World Bank. It argued that poor countries were victims of a vicious circle of poverty… The answer? Rich countries should provide the capital, in the form of foreign aid. …poor-country governments should plan their economies and…competition should be restricted through monopoly rights and barriers to foreign trade. It then describes the revolutionary thinking of the late Peter Thomas Bauer, a Hungarian-born British economist who said the developing world needed economic freedom rather than handouts. Lord Bauer set out alternative theories that, from the 1950s to the 1970s, were heresy. …Opportunities for private profit, not government plans, held the key to development. Governments had the limited though crucial role of protecting property rights, enforcing contracts, treating everybody equally before the law, minimising inflation and keeping taxes low. Moreover, Bauer explained that foreign aid generally had a negative effect because it put resources in the hands of government, thus leveraging more statism. Which is the last thing these nations needed. Writing for the U.K.-based Spectator, Daron Acemoglu and James Robinson explain that foreign aid has a very poor track record. The idea that large donations can remedy poverty has dominated the theory of economic development — and the thinking in many international aid agencies and governments — since the 1950s. And how have the results been? Not so good, actually. Millions have moved out of abject poverty around the world over the past six decades, but that has had little to do with foreign aid. Rather, it is due to economic growth in countries in Asia which received little aid. Meanwhile, the nations getting the most handouts have remained mired in poverty. In the meantime, more than a quarter of the countries in sub-Saharan Africa are poorer now than in 1960 — with no sign that foreign aid, however substantive, will end poverty there. …huge aid flows appear to have done little to change the development trajectories of poor countries… Why? …economic institutions that systematically block the incentives and opportunities of poor people to make things better for themselves, their neighbours and their country. …The problem is that their aspirations are blocked today…by extractive institutions. The poor don’t pull themselves out of poverty, because the basic ability to do so is denied them. What exactly are “extractive institutions”? At the top of the list would be bad government policy, which creates a system in which politicians, bureaucrats, and insiders get unearned wealth via corruption and cronyism. The authors give some powerful examples. To understand Syria’s enduring poverty, you could do worse than start with the richest man in Syria, Rami Makhlouf. He is the cousin of President Bashar al-Assad and controls a series of government-created monopolies. He is an example of what are known in Syria as ‘abna al-sulta’, ‘sons of power’. To understand Angola’s endemic poverty, consider its richest woman, Isabel dos Santos, billionaire daughter of the long-serving president. …every major Angolan investment held by dos Santos stems either from taking a chunk of a company that wants to do business in the country or from a stroke of the president’s pen that cut her into the action. I’d also include the wealthy Venezuelans who have used socialism as a vehicle to enrich themselves while impoverishing ordinary people. To be sure, we have examples of insider favoritism and undeserved wealth in rich nations, but it’s a matter of degree. Cronyism is an undesirable feature of our economy, but it’s a defining feature of nations in the developing world. Acemoglu and Robinson basically reach the same conclusion as Lord Bauer. When aid is given to governments that preside over extractive institutions, it can be at best irrelevant, at worst downright counter-productive. …Many kleptocratic dictators such as Congo’s Mobutu Sese Seko have been propped up by foreign aid. Now let’s shift from looking at nations where failure has been subsidized by foreign aid and instead consider the success stories of economic development. Are there any lessons we can learn? In other words, there is a recipe for growth and prosperity. Nations that restrain the size of government and allow markets to flourish enjoy growth. Which is exactly the message of this video. By the way, you don’t need perfection to get climb out of poverty. China still doesn’t rank very high in Economic Freedom of the World, but it has improved its position over the past few decades and that has helped lift hundreds of millions of people out of abject poverty. Same with India. Yes, both nations are capable of much stronger growth with further improvements in policy, but it’s nonetheless good news that there’s been considerable improvement. Let’s address one more issue that arises in the debate about foreign aid. Professor Noah Smith of Stony Brook University, in a column for Bloomberg, debunks the myth that poverty in the developing world is a legacy of colonialism. …the stolen-wealth theory is wrong. Oh, it’s absolutely true that colonial powers stole natural resources from the lands they conquered. …the stolen-wealth theory is wrong…because the theory doesn’t explain the global distribution of income today. …The easiest way to see this is to observe all the rich countries that never had the chance to plunder colonies. Germany, Italy, Sweden, Denmark and Japan had colonial empires for only the very briefest of moments, and their greatest eras of development came before and after those colonial episodes. Switzerland, Finland, and Austria never had colonies. And South Korea, Taiwan, Singapore and Hong Kong were themselves colonies of other powers. Yet today they are very rich. They did it not by theft, but by working hard, being creative, and having good institutions. Amen. And notice that he also mentions the tiger economies of East Asia. P.S. Given what I wrote the other day about the statist proclivities of the OECD, here’s an item that shouldn’t surprise anyone. Even though South Africa already has an excessive burden of government, the Paris-based bureaucracy wants that nation to impose even higher taxes to fund even bigger government. I’m not joking. The OECD just put out a document entitled, “How can South Africa’s tax system meet revenue raising challenges?” and here are some blurbs from the abstract. …considerable revenues will be needed in the years ahead to expand social spending and infrastructure in order to raise growth and well-being. …there is some scope to raise further revenue, particularly through broadening the base of these taxes further. …An important additional source of revenue is environmentally related taxes. Yup, you read correctly. The bureaucrats at the OECD want people to believe that South Africa’s main challenge is that government isn’t big enough. Heck, they actually want readers to believe that a more bloated public sector will “raise growth and well-being”. Huh, bigger government is associated with more growth?!? I guess that’s why Singapore is so poor and Cuba is so rich. 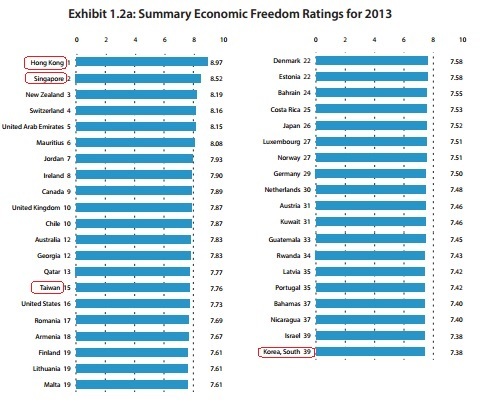 What’s especially remarkable about the OECD’s anti-empirical approach is that fiscal policy is where South Africa get its lowest score in Economic Freedom of the World. It’s almost as if the tax-loving bureaucrats at the OECD are trying to keep that country from prospering. And we’re subsidizing this nonsense to the tune of about $100 million per year. We have so many negative atttibutes yet we dont pay any heed to them. We must extinguish this slumber of ignorance thus giving birth to an enlightened mind which not only helps us but also others to outgrow their fear. The only “free market” is barter and we have not had a free barter market in thousands of years. All monetary systems lead to dictatorship, all hierarchial centralized systems of power lead to tyranny. It’s time for something new not more of the same. Here is a draft containing scraps of an aid career. Just scan. It may contain useful nuggets. At the end of WW II, the U.S. was the only major economy that remained undamaged. Indeed, it began to boom as the pent -up demand of Americans for consumer goods found release and when credits and grants were made to reconstruct the economies of both American allies and previous enemies. The reconstruction was phenomenally successful. In hindsight, reconstruction was comparatively simple. What it meant was replacing the industrial and agricultural physical capital that existed previously that had been destroyed by war. The organizational and technical skills to use the capital had not been destroyed, so it was a fairly straightforward effort to bring previous economic activity into operation by financing the acquisition of new plants and equipment. This effort was even prized by American industry since it afforded a major expansion of their market and customer base. The U.S. taxpayer funded the program to bring economic stability and humanitarian aid to Europe, and, incidentally, hold back the expansion of communism. It also increased wages and fostered full employment. the less developed world. Since technical assistance is a labor-intensive activity, the size of staff increased. sustainable economics, but depend on a continuing stream of public subsidy. When, however, the public and their political representatives begin to question the value or performance of these programs, a battle of political interest groups is enjoined which is a matter of balancing one interest against another. Because political programming is distant, if not immune to market forces, it depends on philosophic beliefs and flights of reason to gain traction. In the field of development economics, the experience has been error prone. For example, back in the fifties, a mantra of economists was “basic industries and infra-structure.” The road to development required countries to develop a steel industry, and a transportation system. The economic experience of Europe and North America clearly indicated that this was the road to development. Wrong. products, the government resorted to the use of additional import tariffs. And since the products using steel were expensive, they found virtually no export market. But Colombia had a steel mill. These investment mistakes were the product of the economic development community, and especially the World Bank. They were based on political and ideological beliefs that were unsustainable by market forces. Those who made the mistakes never paid for them, but Colombia did,…. and so did the American taxpayer. The lessons in development learned in Europe were not wholly lost. Experience indicated that financing the importation of capital goods and spare parts not produced in a developing country succeeded in raising production that could be sold internally as well as in the world market It also financed exports from capital-producing countries. Further, it also provided the lever to convince developing countries to adopt fiscal and monetary policies that were conducive to development. Initially, balance of payments assistance by U.S. aid did not discriminate on the basis of national origin. After all, the main supplier of goods was the U.S. But soon, the recovery of Europe and Japan resulted in competing sources of goods. Congress then took it upon itself to impose a buy-America policy when U.S. funds were used. From an economic perspective, this violated the well-accepted principle of free and open markets. The U.S. economic free trade purist resisted, but lost. The bureaucrats, however, didn’t. identifying non-U.S. goods from foreign sources that used U.S. parts or materials. That became eligible for funding. They also practiced the bait and switch tactic, that is, transshipping non-U.S. goods from U.S. ports as goods originating in the country. Like tax dodgers, the capacity of commerce to seek loop-holes or construct non-transparent violations of law succeeded. More employment for operating overhead and lawyers resulted. or pornographic statues within the mass of holy images, one aid official created a Burmese buyer of U.S. goods, and named him “Koo Ming Ling.” It escaped notice. “Don’t use any of my money for abortions,” funds from the other sources could be used to cover the procedure. This kind of bait and switch is used all the time, both in public as well as private business, to circumvent the intent of law. In past we pressure U.S. Gov. To aid from Commie fear, not love. We’ll do all right with A.I.D. All right, they give us more money. Then we raise bigger family. subject to taxation in the country that they lived. Oolala! A raise and a total tax exemption! Oh, joy! Oh, rapture! One of the hang-ups of program lending was a strong prohibition against actually telling borrowers what monetary and fiscal policies they had to adopt to obtain a loan approval. Such a direct prescription of policy was viewed as a clear violation of the borrowing country’s independence and sovereignty. You can now imagine the charade of a program negotiation. The condition of the borrower’s economy would be presented by the borrower to the lender. The borrower was then asked to present the actions it proposed to take to correct the situation. The lending institution would review the proposal and point out where it was deficient. The borrower would then take these comments and modify its proposal. The cycle would be repeated until the borrower came up with what the lender largely had in mind. It was much like a husband and wife deciding on what restaurant to go to. The wife says, “You decide.” The husband says, “Italian.” The wife then says, “No. I’m planning spaghetti for tomorrow.” The husband then says, “Chinese.” The wife says, “No. We went there last time.” The husband then says, “You choose.” The wife then says, “No. I did last time.” Given time, the husband lucks out and hits on the restaurant that the wife wanted to go to all along. Once a program loan was approved, releases of funds, referred to as tranches, occurred. The initial and subsequent releases were based on the successful implementation of the borrower’s plan. Rarely, if ever, does implementation go as planned. When the release of tranches are delayed, institutional difficulties arise. National sovereignty is violated. Diplomatic disruption occurs. Politics comes into play, and after much wrangling, expectations are reduced and releases of tranches resume. There is the story of a man tossing in bed and not being able to sleep. His wife turns to him and asks, “What is the problem, Sam?” The husband confesses that he owes his friend, Joe, $100,000. Payment is due in the morning but he doesn’t have the money. His wife then picks up the phone and calls Joe. “Hello Joe,” she says. “You know the $100,000 that Sam owes you? Well, he tells me he hasn’t got the money. Thought you’d like to know.” She hangs up the phone, turns to her husband, and says, “Now you go to sleep. Let Joe do the tossing and turning.” The IMF and the World Bank do a lot of tossing and turning. to hold off the advance of communism. It was justified further by the need to respond to the human suffering of the people who suffered the devastation of war. Real politick required the former. Support of the American people leaned on the latter. Americans should be justifiably proud of their efforts to help feed and clothe the hungry here in the U. S., but also throughout the world. Few Americans have the historical memory of the aid sent to Europe after WW I that was administered by Herbert Hoover. His successful management of the program went a good way toward making him electable as president. This largesse continued through WW II and to this date, especially through what is known as PL 480.
people. But the results were not always good. In many instances, the results could be considered disastrous. When cheap food is imported by a country, consumers benefit by paying less for these necessities. It frees up funds for the purchase of other goods, and may even result in savings. But these benefits are gained at the expense of domestic food producers. As the price of food drops, domestic farmers lose income. They can go bankrupt, migrate to the city, and swell the ranks of the unemployed. They can switch to non-imported products. In either case, they are not happy. They may even become hostile to their government, and the country supplying cheap food. At the same time, what once was a system largely based on market forces, becomes a politically and bureaucratically managed food supply system. luxurious quarters for overseas staff, the money just couldn’t be exhausted. agricultural constituency. In final analysis, through the good offices of Senator Moynihan (? ), the entire amount due was written off as uncollectable, which was true. But we ought not to forget the impact of these foods in India. One side affect was that, since food was free or cheap to the Indian government, it could indulge in financing projects of questionable economic sense. It provided a means for funding projects desired by powerful interest groups, avoiding review by domestic and foreign oversight groups. In at least one instance, India exported grain to other countries in need while still qualifying for subsidized grain imports from the U.S. In addition, because the cost of grains dropped, Indian farmers shifted out of these crops, exacerbating their dependency on imported foods. Finally, as was their inclination, India chose to castigate the U.S. in the press for its use of PL 480 as evidence of American economic imperialism. But India is far away, and the U.S. had bigger fish to fry than whine about the ingratitude of the “largest democracy” in the world. support to cover their operations looked to PL 480 as a grab bag for program support. In the early 60’s, when Vietnam was a serious, but contained, aid program, PL 480 was requested by the U.S. Mission to ship rice to the area. The rice was to be sold in the Saigon market for local currencies which would then be used to pay for the training and salaries of South Vietnamese soldiers. The request came into Washington and those administering aid to Vietnam were asked for speedy approval. As was wont, the PL 480 review asked for further clarification. Vietnam was a rice exporting country. There was no shortage of the commodity in the country. The country team responded that the cost of rice was high. And besides, they needed the local currency to pursue the war. The PL 480 review paused and pointed out that local rice was indeed available and that, should PL 480 rice be sent to Saigon, prices would plummet. Rice producers, the small farmers in rural areas where the war was being fought, would become disaffected from the government of Saigon and would have reason to ally themselves with the insurgents. The direction of trade would shift toward the Cambodian market with insurgents functioning as middlemen. Such a change would go counter to the purposes of U.S. presence in Vietnam. The review team suggested that PL 480 thus not be used and that other imports be considered and funded by other sources, e.g., military or balance of payments assistance. The country team became irate and pushed for immediate approval based on U.S. security grounds. They had other uses for the funds under their direct control. The bureaucratic battle was enjoined. government. Secondly, because the rice would alienate the rural constituency in South Vietnam, the U.S. would be contributing to the loss of the hearts and minds of those Vietnamese people who were precisely the ones we wanted to wean away from the insurgents. The issue went up the White House. Politics worked its wondrous ways and the rice to Vietnam was approved. Those who argued against the shipment were accused of “disloyalty” to the administration. Apparently, Bobby Kennedy blew up. He was quoted as saying something like, “The president wants American presence in Vietnam as obvious and visible as a red school house on a hill.” Within months, those who had the temerity to question the country team were transferred to other posts. clearest examples. The domestic concern over abortion directly affects program implementation. The pursuit of abortions by supported organizations is prohibited, but difficult to police, much less obeyed by workers in the field. The same applies to the use of bribes or illegal payments to get food to the starving children anywhere. Ingenious ways are used to comply with the letter of the law while continuing to disobey them in implementation, not dissimilar to clever forms of tax evasion. The future of foreign aid is clouded, but it will probably continue, one way or another. Already the IMF and the World Bank are being challenged to justify their continued existence. Through greater transparency in operations and the increased role of market forces, there is the suggestion that the global financial system could take over much of their operations. Their role of giving cover to the political wishes of donor countries is becoming more obvious and questionable. Bilateral aid may return to play a larger role, be it through subsidized credits, more write-off of existing debts, or NGO operations. What will clearly continue are those forms of aid that receive support directly via private contributions. They are more reflective of humanitarian interests than the machinations of small and large governments. But there are indications that the lessons of the past are not being learned. As aid to Afghanistan gains support for strategic, security, or humanitarian reasons, funds will be sought, received, and spent. Early indications as to the direction of expenditures are troubling. Much of the aid is likely to be directed through the United Nations. Already priorities announced promise expenditures for back wages for Aghan bureaucrats, teacher salaries, education, and health. Experience suggests that little of these expenditures will result in economic development in the near term, and may even be questionable in the future. but economic growth is not generated in the short term. performance, and access to information are more powerful engines of growth than literacy. One would like to add democracy to these engines of growth, and it may be, but probably in small and controlled doses. Singapore comes to mind as an example. food, from the local economy lest they lose the battle for independence and self-sufficiency for those being assisted, as well as that of the host country. There is some parallel with the experience of the U.S. with its War on Poverty programs. Tragically, health care has its hazards as well. The understandable concentration of assistance to children dying of malnutrition and dehydration tugs at the heart strings of all who see its affect on the innocent. It would be hard to shift priorities and resources away from critical care to safe water and sanitation, but, the return in the short and long term would be substantial. These public health measures affect the whole population, including adults who are able and willing to work if they weren’t sick and if jobs were available. occur efficiently. Let the economy fund the social services it can reasonably sustain. Above all, do not export U.S. domestic program priorities in health, education , and welfare. That is for the Afghan society and economy to decide and support. Government-to-Government Aid – Foreign aid is mainly between governments. It is not the result or the interplay of market forces. It is a high form of command economics not grounded on sustainable economics. It favors living on a continuing stream of public subsidy. The lessons learned post WWII ought not be lost. That experience indicated that financing the importation of capital goods and spare parts not produced in a country succeed, particularly in the reconstruction of past capacities. Further, it also provided the lever to convince countries to adopt fiscal and monetary policies conducive to development. suggests that this transferred succeeded only in “politicizing” these institutions. Now, loans were reviewed and approved by international consensus. The log-rolling and back-scratching game could now be played by politicians throughout the World. They became the nirvana of international economists from all member nations. The leadership became the resting place or nest of fallen eagles. i.e., temporarily failed, or unelected politicians. One of the hang-ups that accompanied “internationalization” was a strong prohibition against actually telling borrowers what economic and political policies made them poor credit risks. Such straight talk was viewed as a clear violation of the borrowing country’s independence and sovereignty. In actual fact, economic assistance is not solely justified to achieve economic development. Its tap root is deeply embedded in political and security considerations. The reconstruction of Europe,for example, was viewed as a necessity to hold off the advance of communism. It was justified further by the need to respond to the human suffering of the people who suffered the devastation of war. Real politick required the former. Support of the American people leaned on the latter. Islamic fundamentalism bent on humbling the American Satan. American humanitarianism exists and touches the heart of a generous people, but it plays a secondary and problematic role.